Q: How can I paint the rusty steel railing that goes across the front of my property? I want the results to lasts. A: If the rust is just cosmetic (and it almost always is with outdoor iron or steel railings), then there are two steps to success: surface preparation and paint application. First, get your hands on an electric drill. Nothing fancy, just a lightweight model that fits in and around your railing components. You’ll find cordless most handy, but corded is fine, too. You’ll also need to buy a round wire brush attachment for the drill, the kind with a shaft you can lock into the drill’s chuck. This is your heavy duty rust remover. Different wire brushes for drills have bristles on the sides or bristles on the ends. Buy a few different types so you can experiment and see what works best. You could use a hand-held brush to remove old paint and rust, but it takes a lot of scrubbing to get all the loose stuff off. The real danger using only a hand-held brush is that you won’t get all the rust off. This said, a hand-held brush may be useful for nooks and crannies that your drill can’t get into. Put on a pair of safety goggles, switch the drill ON, then methodically work your way up and down each railing spindle. 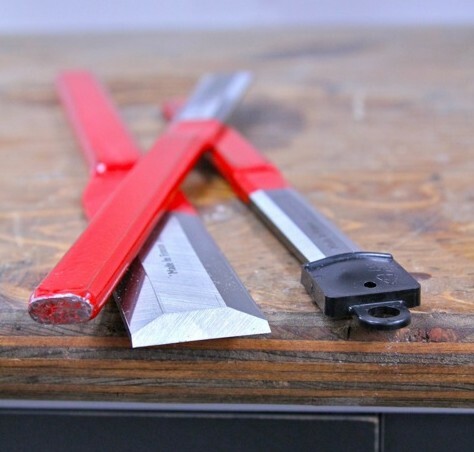 You needn’t get down to shiny metal, but remove everything that’s flaky. Even with a drill, this will take a while. I find taking short breaks useful when my patience and attention is wearing thin. A change really is as good as a rest. Tremclad is the best paint I’ve used for exterior steel and iron. I’ve used it for more than 30 years and never found anything that endured better. You don’t need a primer when Tremclad is used on any kind of ferrous metal, either. There are cheaper exterior paints for metal, but it makes no sense to cheap out when paint costs are such a small part of the effort required for the job. Brush or spray application? Tremclad comes in both containers or spray cans, but for a project as big as a railing, I go with brush. Spray cans are great things, but they’re much more costly for a given area covered. Brush application can be surprisingly fast, and you don’t have to worry about overspray hitting neighbouring areas. Brush application is also ideal for small sections of railings on porches specifically because there’s no overspray. If the railing you’re working on has a sidewalk or pathway underneath it, slip a piece of corrugated cardboard or plastic sheet underneath the area you’re working on to catch any drips. Also, if you can find a partner so you can paint both sides of the railing at once you’ll be much better off. Besides the benefit of being able to talk while you work, you’ll get better results if paint is not allowed to dry on one side of a spindle before the other is being coated. 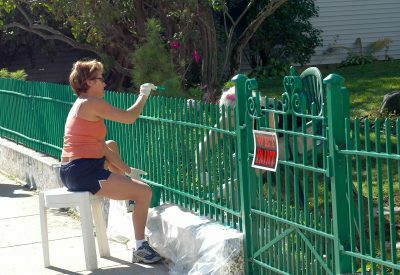 Painting solo will result in hardened runs and drips on the opposite side of the railing, a problem that can be avoided by painting with a partner.